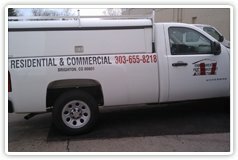 A1 Environmental Pest Management & Consulting has been proudly serving the Denver Metro area for several years. With over 40 years of experience we are dedicated to providing our customers with the proper solutions for all of their pest control and wildlife needs. We believe in tailoring our pest programs in a way which works best for each individual customer. Our crew is professionally trained and has the experience to handle any size job. We service both commercial businesses and residential areas. Call us today to schedule your inspection, and you can be assured our trained professionals will keep your home or business pest and wildlife free. It is with extreme pleasure that I write this letter of reference for Benny Krusen and A1 Environmental Pest Management. Being in the apartment industry for many years, it is not often we deal with a reparable company such as A1 Environmental. Benny’s professionalism and skillful knowledge of the business were apparent in our first meeting. A1 Environmental Pest Control has truly been an asset for keeping us pest free. I know that if any pest control problems arise, a quick phone call to Benny puts our minds at ease."